a little squinty from the wind... haha.. I'm not quite over summer yet (we still have time left!) but it doesn't hurt to think about fall/autumn.. right? I read that emerald green is coming in as a fall trend color. 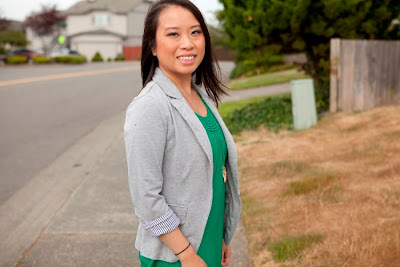 I never was huge on following season colors but I had this pretty emerald green blouse that I bought last year hanging in my closet that I thought fitted for this upcoming season. I paired it with a heather grey cotton blazer and some gold accents. It's a pretty color combo. What are some bargain buys have you had lately? Greetings from another pacific NW blogger who loves food and fashion! I just discovered your lovely blog! That ring is an absolute steal. Hope you have a great weekend! 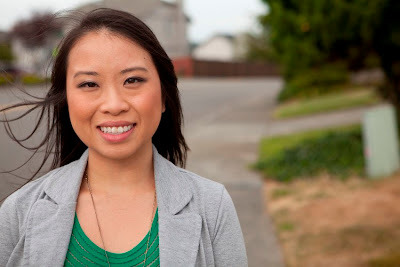 Love the green top & I love your blog too! I just signed up as your latest follower - it would be great if we could follow each other! I love the green top and the rings!! Ohh yeah, I love deep/jewel tone colors in the fall, I think those colors are a great way to spice up a look! And lastly, congrats on the one month mark on your blog, keep up the good work and soon you'll have hundreds of followers!! Love the emerald green top. 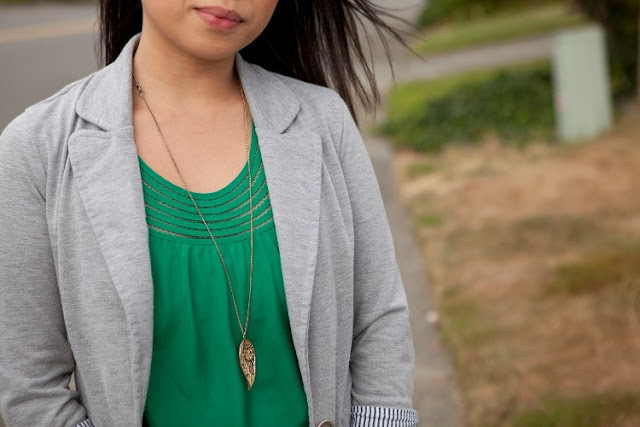 The grey blazer complements it well for a subtle look.Your rings are awesome girl! Cute outfit! Love the emerald green top! You look great loving the look! and thank you for the lovely comment on my blog :) I am now following you on GFC maybe a follow back :) ? kisses! Love that green on you..and the necklace is fab! The rings are so pretty! Great blog post! You look very nice and I really love your ring!!!! Would you like to follow each other via GFC? I would love to! P.S. I'm following you via GFC!! ahh you look gorgeous!!! i LOVEEEEEEEEEEEEEEEEEEEEEEEE emerald on you!!! so beautiful!! i heard emerald's suppose to be the "IT" color this fall!! hehehe.. omgosh your ring is amaze.. i can't believe it's a YSL dupe.. so cute! You look so gorgeous, girl.. That outfit is seriously bomb.. and THAT RING! omgggg T__T I'm seriously drooling over it! The emerald is sooo pretty on you! & I love a good bargain.. the ring looks just like the arty! I'm a sucker for a good blazer. I love the green on you. Lovely outfit! 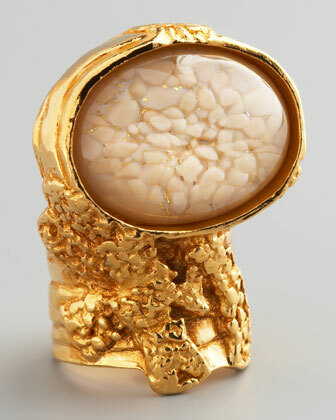 :) YSL rings are amazing! Thank you so much for stepping by! I followed you back dear! 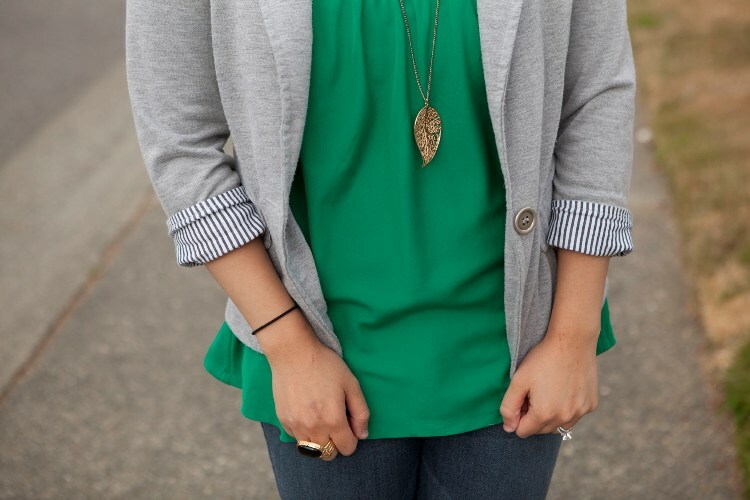 Love Emerald green on you so much and grey adds to the outfit! Thank you so much for the comment! If you'd like to stay in touch, it would be so nice if we started following each other? Let me know <3 Have a nice day! love the ring! 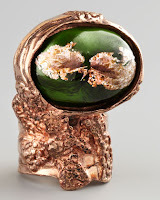 one day I want to own all the YSL arty rings haha. love that ring! its gorgeous! That skirt is gorgeous! I absolutely love your outfit. havе a great read. Thаnks for ѕharing!